First of all, let’s decide what charcuterie tapas and mezze mean. To do that, we’ll rely upon our trusty Wikipedia definitions verbatim. 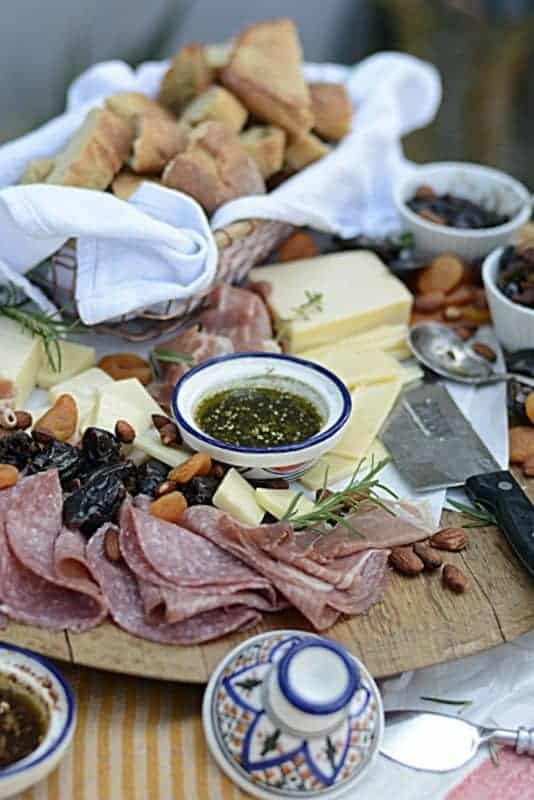 And, as you read my thoughts on creating your own masterpieces, yes, I’ll be giving you my five tips on charcuterie tapas and mezze, you’ll also be seeing photos of my creations that I’ve shared with family and friends. I’d love to see your designs. 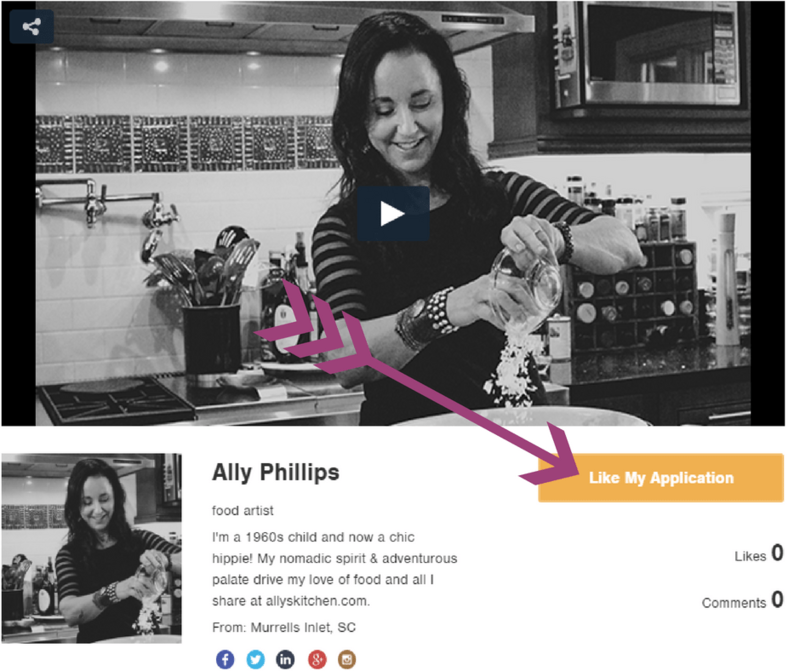 Share them with me at Ally’s Kitchen on Facebook! I just may using ideas of yours with my next entertaining! 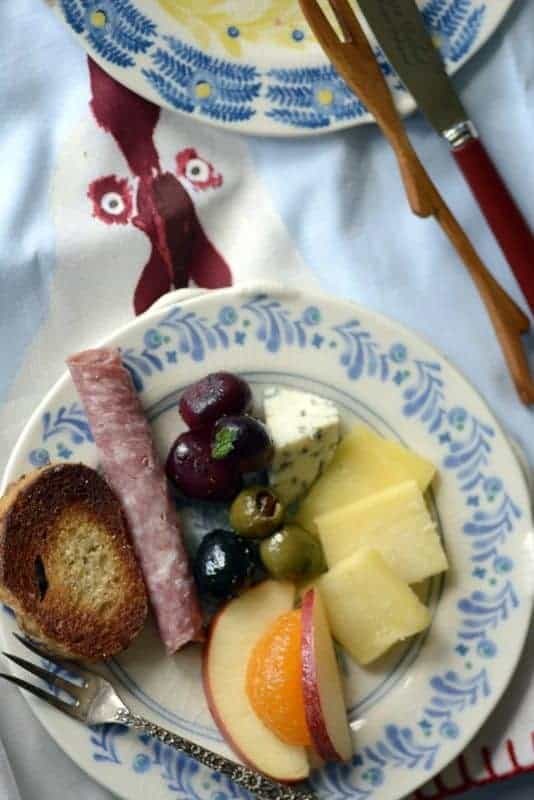 Charcuterie (/ʃɑːrˌkuːtəˈriː/ or /ʃɑːrˈkuːtəri/; northern French: [ʃaʁkytˈʁi] or southern French: [ʃaʁkytəˈʁi], from chair ‘flesh’ and cuit ‘cooked’) is the branch of cooking devoted to prepared meat products, such as bacon, ham, sausage, terrines, galantines, ballotines,pâtés, and confit, primarily from pork. Tapas (Spanish pronunciation: [ˈtapas]) are a wide variety of appetizers, or snacks, in Spanish cuisine. They may be cold (such as mixed olives and cheese) or hot (such as chopitos, which are battered, fried baby squid). 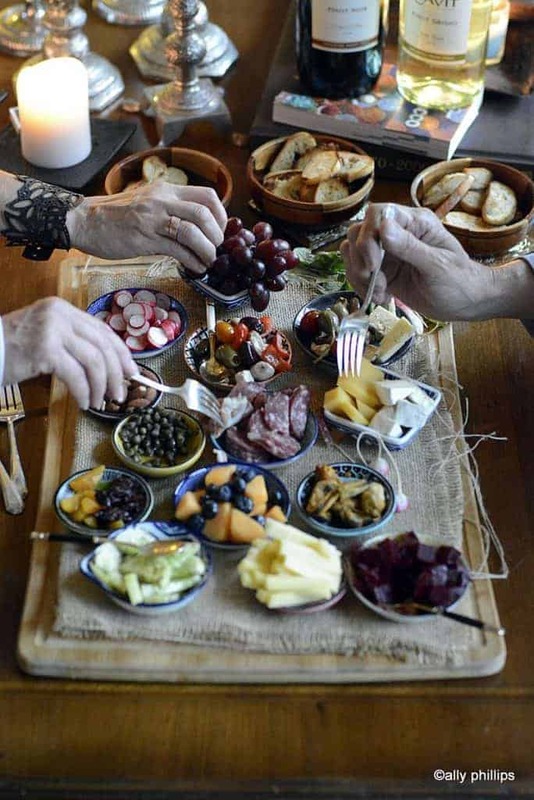 The serving of tapas is designed to encourage conversation, because people are not so focused upon eating an entire meal that is set before them. 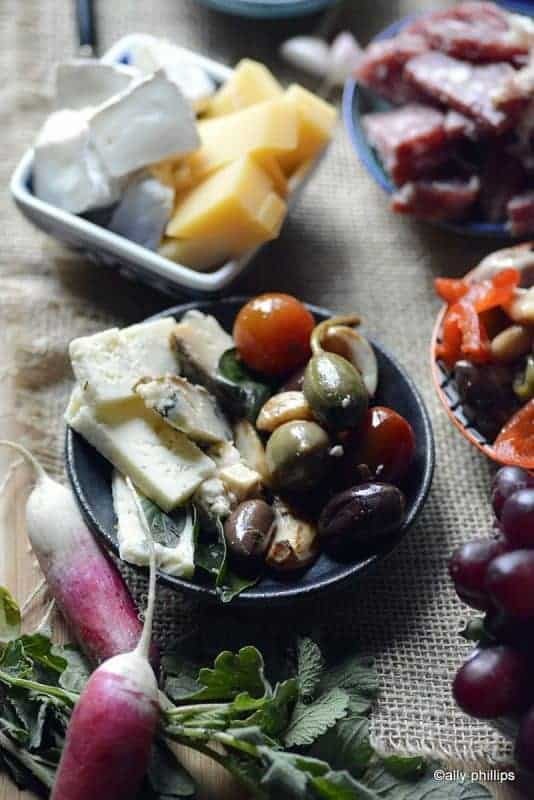 Meze or mezze (/ˈmɛzeɪ/, also spelled mazzeh or mazze; Persian: مزه‎‎; Turkish: meze; Greek: μεζές; Serbian: мезе; Bulgarian: мезе; Arabic: مقبلات‎‎) is a selection of small dishes served to accompany alcoholic drinks in the Near East, the Balkans, and parts of Central Asia. 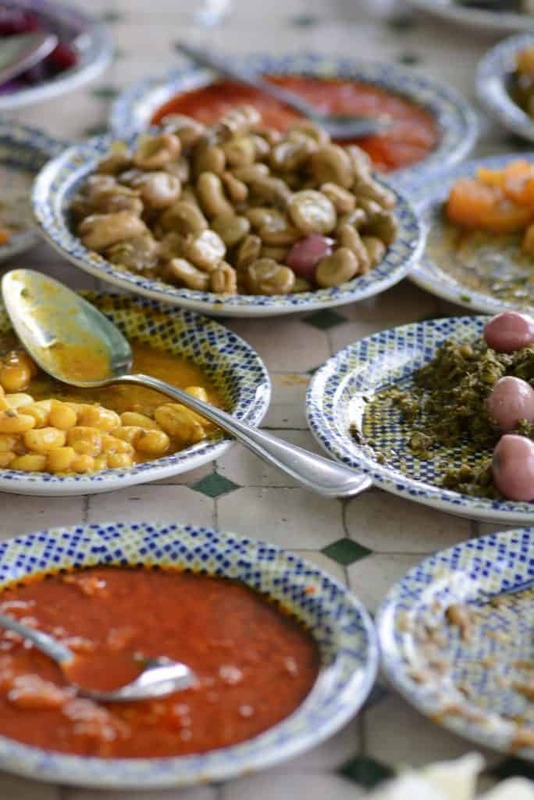 In Levantine, Caucasian, and Balkan cuisines, meze is often served at the beginning of multi-course meals. Is there an ‘art’ to creating each of these? I say no. 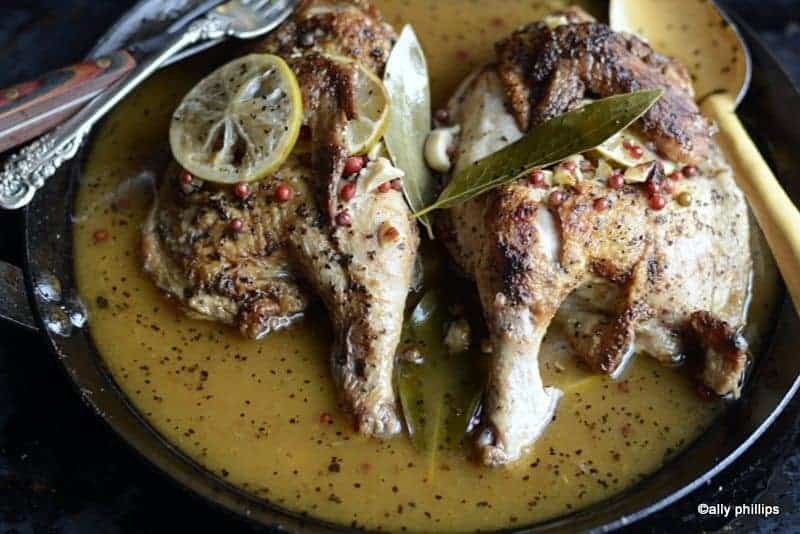 What you need is the expansive idea that anything and everything can be tasty, flavorful and blend when eating this way. 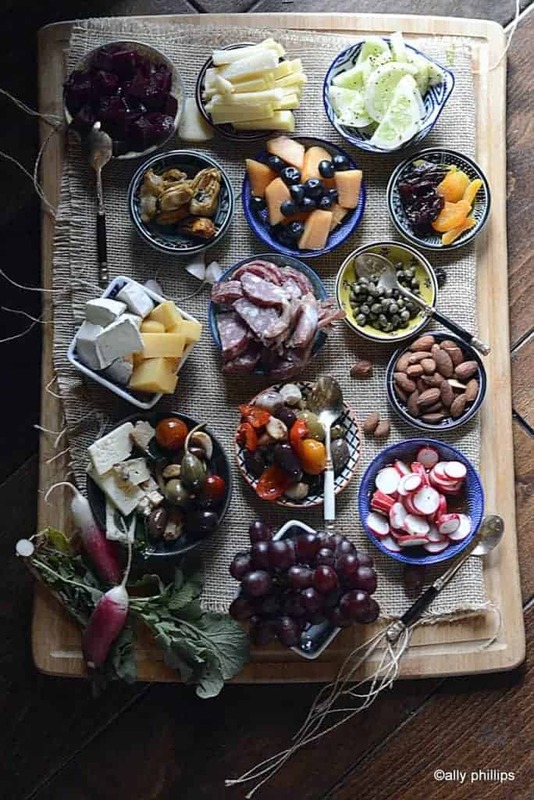 And, you can realize that serving in the style of charcuterie, tapas or mezze ignites more than just food. It brings people around a smaller space where sharing and camaraderie is encouraged. And, it promotes the art of lingering and relaxing unlike sitting down to a meal at the table. 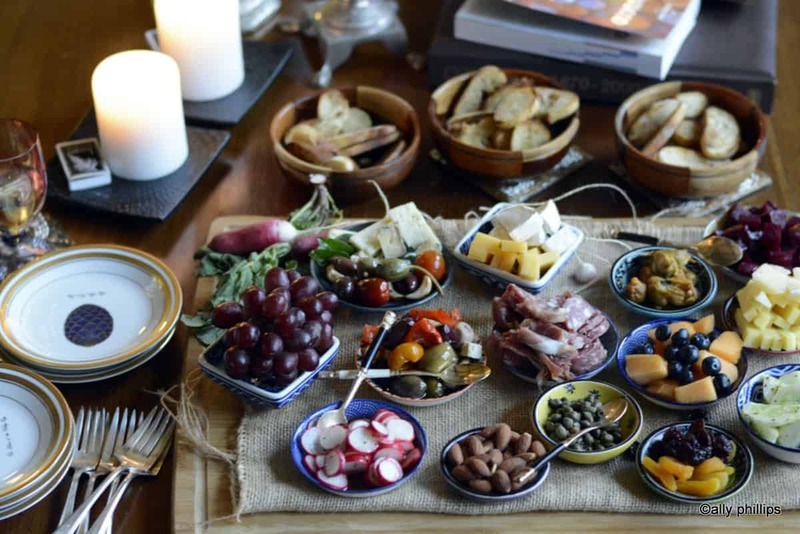 My tips for designing your best charcuterie, tapas or mezze are simple and easy. Be sure to put your own touches on it! There are really no rules. You can play with any ideas and concepts that make you happy. 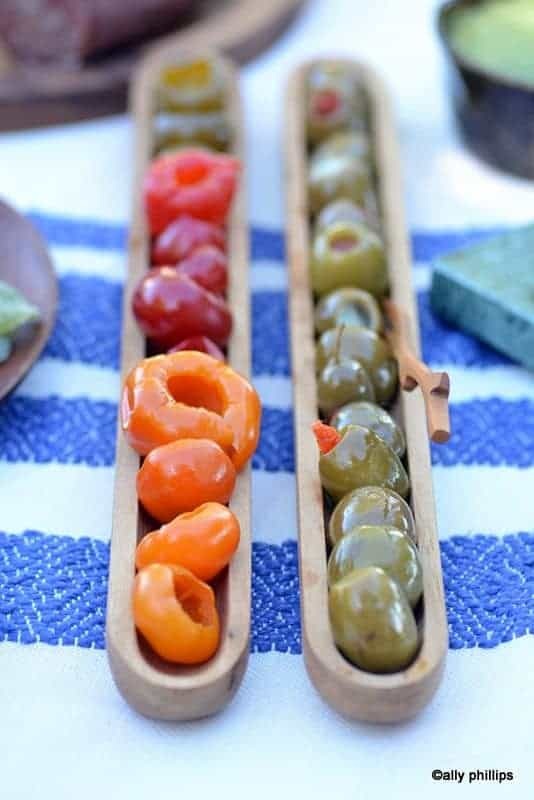 The big underlying foundation of eating this way is small so you can have a multitude of tastings! 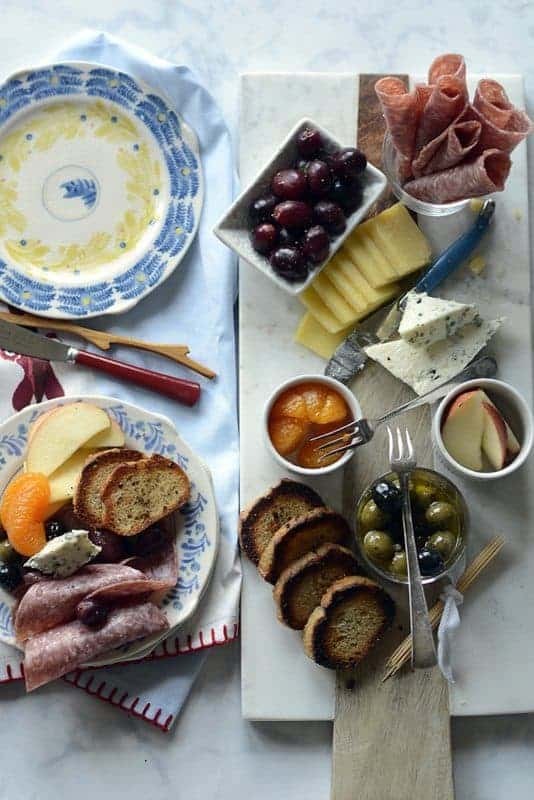 TIP 1: A charcuterie tapas or mezze for one, two or ten (or more). It’s up to you! 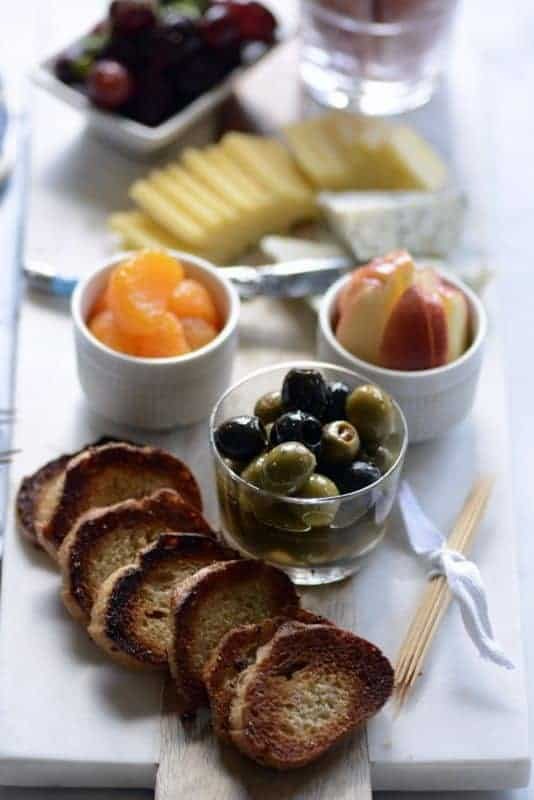 There are many an evening, especially if it’s just me or Ben and me, that I’ll rustle up a platter of nibbles just for us. TIP 2: Combine an array of small colorful plates and bowls. Keep them small because you’re going to have quite a few options from which to choose. 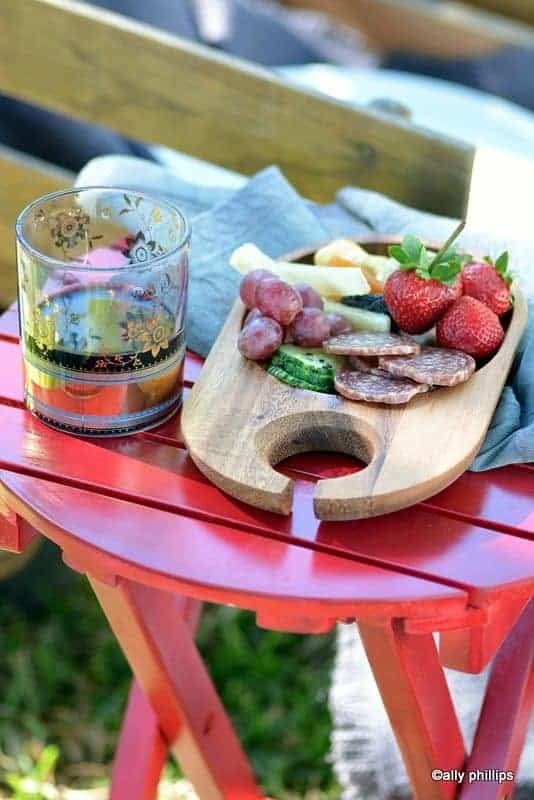 And, you want to display everything on one large platter, wooden cutting board or maybe a small table (like a coffee table). TIP 3: Use different textures, patterns and finishes for your serving pieces. Wood. Ceramic. Solids. Patterns. MetalS. Linen. Burlap. And, more. TIP 4: Think outside the box with what you’ll be serving. Chilled cucumbers. Rice vinegar radishes. Pickled anything. Diced beets. Tabbouleh. Bite size slices of meats. Cured meats. Seasoned garbanzo beans. Hummus. Cheeses. Nuts. Dried Fruits, Fresh fruit bites. Jams and jellies. Crackers. Grilled toasty bread bites. Olives (preferably pitted!). Nuts. And, more. TIP 5: Have small, coffee saucer size, plates that folks can put their nibbles on. Doesn’t need to be any larger. Small cocktail size napkins and small forks. There are so many places you can pick up great things like this. Think dollar stores, World Market, Pier1, Home Goods and more. Finally~ Kick back and have fun! As the host, your work is done. Time to enjoy!